A couple of weeks ago we set off on a dull, overcast Friday evening to a food festival we had been invited* to at Haigh Woodland Park in Wigan. Neither of us have been for a long time, despite it only being 20 minutes away. As soon as we arrived it absolutely poured down, we parked up on the large car park and made our way to the Kitchen Courtyard. I have to be honest and thought it would be a wash out but I couldn’t have been more wrong. When we got there it was quiet as we were invited to listen to the kitchen tenants talk before it all officially kicked off, this gave us a chance to have a look round and see the various food and drink stalls that were on offer. We also had a nosy at the park as there has been some major redevelopments since we were last there. There are now some amazing high ropes, an adventure playground, crazy golf, adventure golf, acres of woodland and walks as well as conservation pigs. We will definitely be returning during the day with Lucas. There was also a DJ playing music in the centre of the courtyard who played a great mix of music and plenty of Wigan Casino songs. We grabbed a drink from Two Left Feet Tap and Brewery and looked around the collection of independent artisan food and drink retailers along with a fantastic selection of street vendors and pop up kitchens. We ordered some food from Ruby’s street kitchen, I had a Vegan Thali which was incredible and D had the speciality chicken wrap. 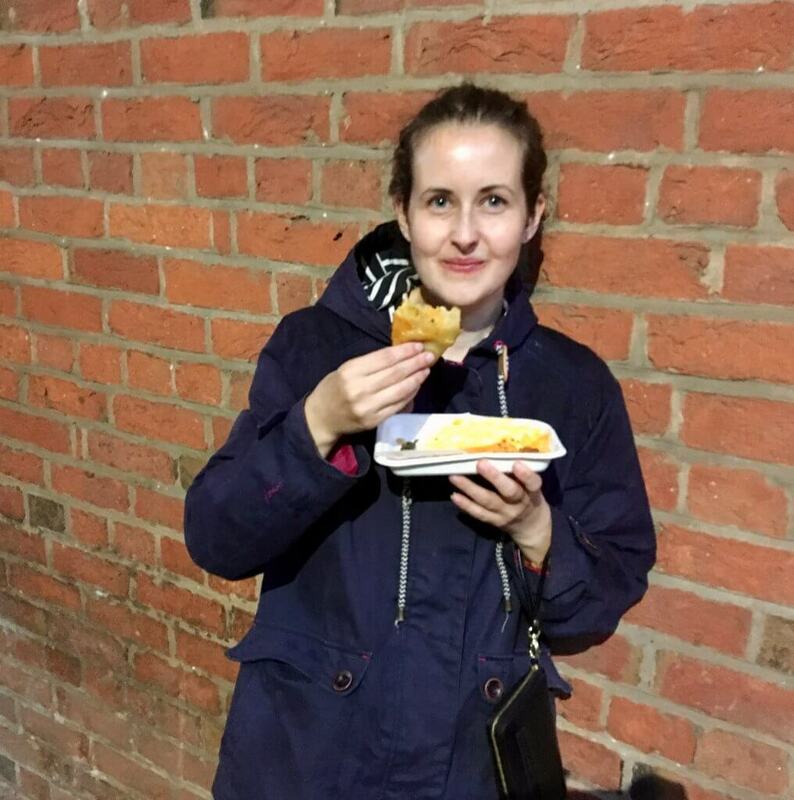 By the time we had eaten those, the courtyard had began to fill up nicely which a great mix of ages and many had braved the elements and walked – which tells you something is right if they come by foot on a very wet September night with toddlers in tow. The Kitchen Courtyard has everything from freshly baked bread and pies from All You Knead, delicious chocolate from Luisco Chocolate (we got one of her chocolate lolly’s in our goody bag and it is the best chocolate I have ever tasted! ), fantastic locally sourced meat from Cook & Foragers (everything is from within 25 miles from independent farmers), amazing ice-cream from Holden’s not mention the vibrant AM Florists. After a mooch about we decided we would try another one of the vendors this time we opted for Mexican from Fiesta Catering. 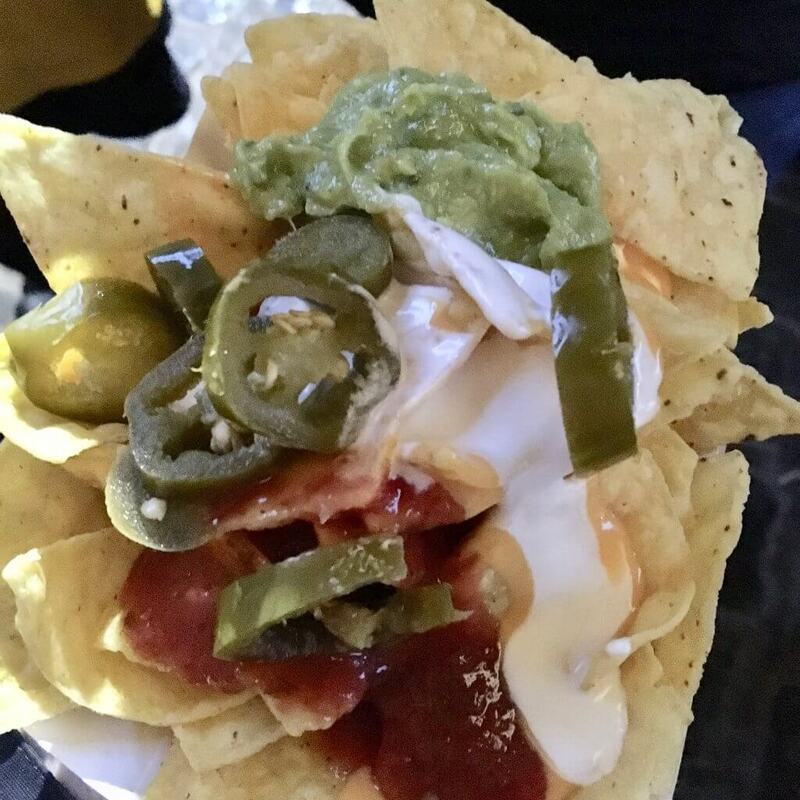 I had nachos and D had a Diablo burger. Again, we couldn’t fault anything, both were delicious. 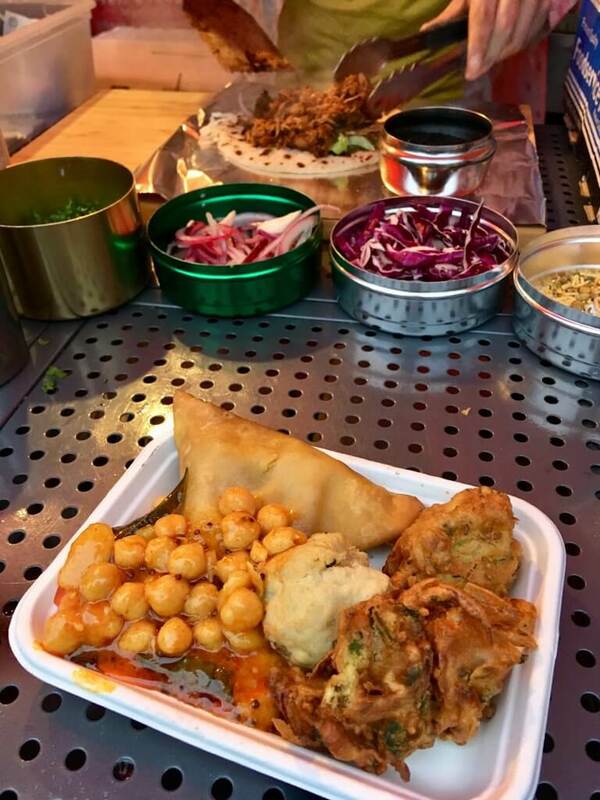 Once we had finished we looked at the other vendors with dishes on offer which included Thai, Syrian, Portuguese, Indian and Caribbean. The aromas combining in the air really did make your mouth water. There were also a couple more pop up bars meaning we hardly had to queue. We headed to Holden’s as we left and grabbed the most scrumptious waffles and ice cream to share. 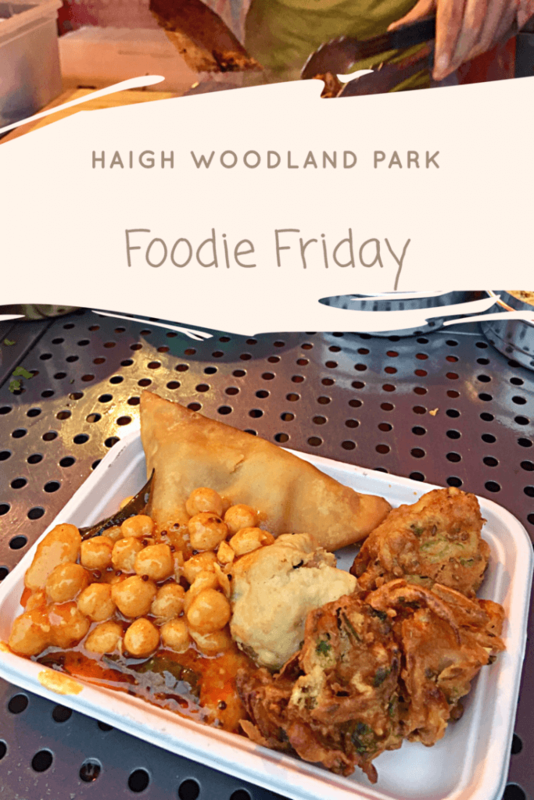 Haigh Woodland Park and the Kitchen Courtyard put on a fab variety of food events in conjunction with Wigan Council including Haigh Foodie Friday, which is held on the last Friday of the month during the Spring and Summer with special Foodie Sunday’s throughout the winter months. Looks like you had a great time! I love a food festival getting to try all kinds of different food. Oh gosh that waffle looks amazing! I love food festivals so would love to visit Haigh’s foodie Fridays. You just can’t beat all the delicious smells and trying lots of different foods can you. That is certainly a great array of international foods! If only I lived closer to Wigan *sighs*. Hope the future events are as successful. Looks like you had a great time despite the wet weather. The food looks super delicious. The waffles and ice cream are making me want to visit! Lush! 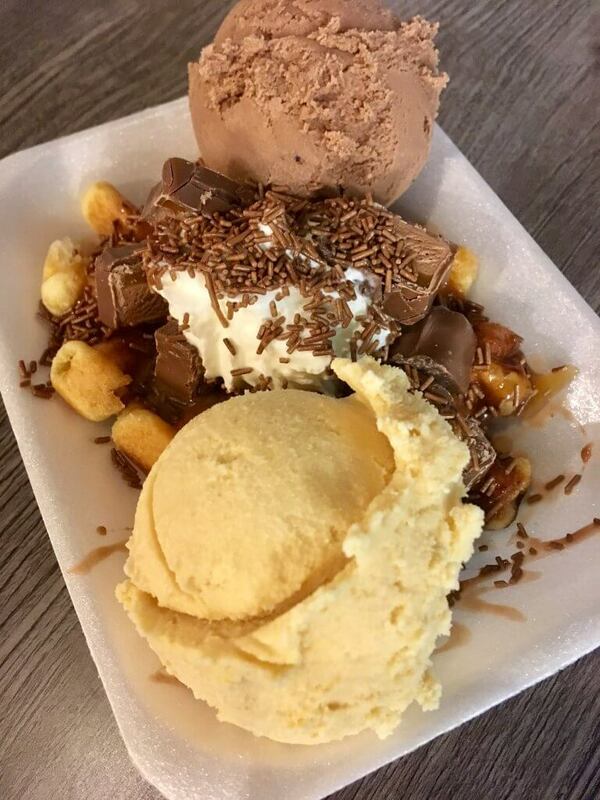 Those waffles and ice cream look amazing!